Dr John Horder was both a past President of the General Practice with Primary Health Care Section of the Royal Society of Medicine and the founder of CAIPE, serving as its first Chairman then President .These organisations share his values. John was born in 1919. He initially intended to become a musician but after going up to Oxford switched to medicine. After qualifying his plan was to become a psychiatrist but after doing locums became fascinated by general practice. He eventually became senior partner at the Kentish Town Health Centre where he stayed for the next 30 years. He was involved in the original development of the Royal College of General Practitioners and was president between 1979 and 1982. He passionately promoted general practice as a specialty in its own right and equal to others. John inspired generations of medical students and general practitioners with his holistic and psychosomatic approach to medicine challenging the traditional disease centred orientation. Having completed his term as RCGP president, it was a natural progression for John to become involved with interprofessional education, recognising from his experiences the value in developing a national network in changing the behaviour of different health and social care professionals. John became a founder member of CAIPE which was started in 1987. He was CAIPE chair for 10 years and then CAIPE president. He died in May 2012. In the memory of John Horder and in the spirit of his thinking The General Practice and Primary Health Care Section Council, RSM and The Centre for the Advancement of Interprofesssional Education (CAIPE) jointly present an annual John Horder award to an interprofessional team working within the community demonstrating outstanding principles of collaborative working. 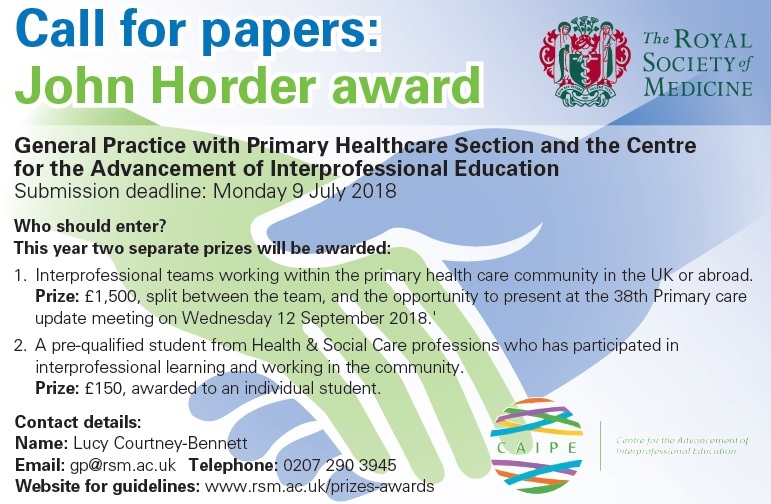 There is an additional award presented to a prequalifying student from health and social care professions who has participated in interprofessional learning and working in the community.